A Finned Jellyfish is the finned version of a Jellyfish. 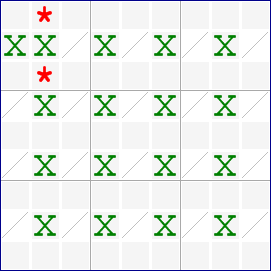 It is a single-digit solving technique. When 4 rows only have candidates for digit X in 4 columns and a single box that intersects with at least one of these 4 columns, then we can eliminate all candidates for digit X inside that box, which are located on one of these 4 columns, but not on one of the 4 rows. Swap the words "rows" and "columns" in this definition for a Finned Jellyfish "in the columns". The cells marked X almost form a Jellyfish in 4 rows and 4 columns. However, the fin cell in r2c1 prevents us from exploiting this Jellyfish, because this candidate adds a 5th column to the pattern. If the fin were not present, we would be able to eliminate all remaining candidates from the columns containing an X. On the other hand, if the fin were present, we could eliminate all remaining candidates in box 1. In both cases, the starred candidates will be eliminated. Like the basic Jellyfish, you do not need a candidate in each cell marked X. In fish techniques, the cells without a candidate are more important. This page was last modified 19:00, 27 August 2007.